We are really happy to welcome here prof. Ruzena Bajcsy! 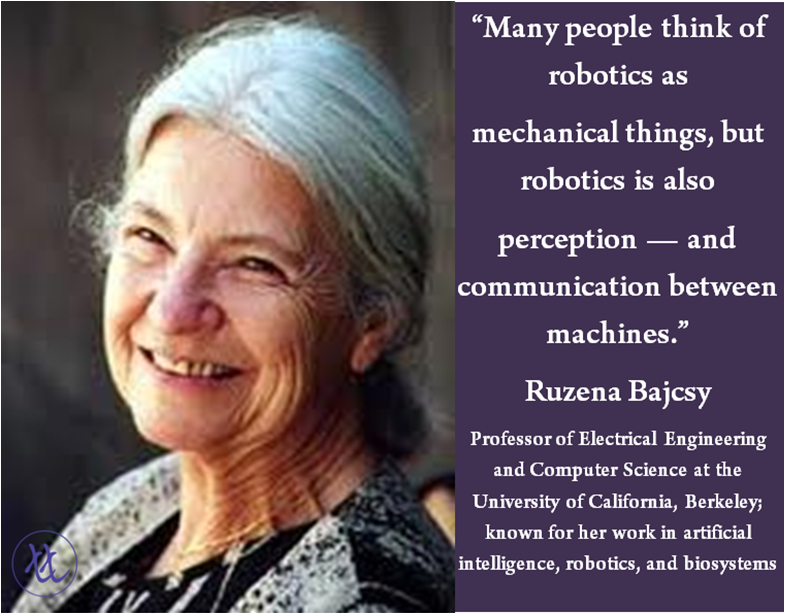 Ruzena Bajcsy is an American computer scientist specializing in robotics. He is Professor of Electrical Engineering and Computer Science at the University of California at Berkeley, where she also holds the post of Director Emeritus of the CITRIS. In the past, she worked as a professor and head of the Department of Computer Science and Engineering at the University of Pennsylvania where she was the founding director of General Robotics and Active Sensory Perception laboratory (GRASP) and a member of the Neurosciences Institute at the School of Medicine. She was also the Director of the Science and Computer Science Foundation. She graduated from her master and doctoral studies in electrical engineering at the Slovak Technical University in 1957 and 1967 and received another doctorate degree at Stanford University in Computer Science in 1972. From 2003 to 2005, she was a member of the President´s Advisory Board in the area of information technologies. In November 2002, her name was listed in the 50 most important women in science. She accepted the invation to lead the seminar at PIS - today at 4 PM. She will talk about low physical agility and sedentary lifestyle can cause serious health problems, even with the younger population. It is equally obvious that every human’s anatomy and physiology is different. We are therefore developing personalized models of kinematics and dynamics of an individual during physical activities, using system identification methodology. This has been facilitated by the development of various noninvasive and relatively affordable sensors for measuring position, velocity, acceleration, forces, electric signals, blood oxygenation etc. We are using advanced computational tools from the fields of robotics, control theory, and optimization theory. Our particular experimental paradigm is based on the sit-to-stand exercise. We process all the measurements, interpret them, and generate individual predictive models of the physical performance of the individual. Finally, we design interventions, i.e. assistive devices to help the individual function better in daily activities. The validity of our approach and its predictive performance was tested on a group of subjects from the UC Berkeley and UC San Francisco Medical School.